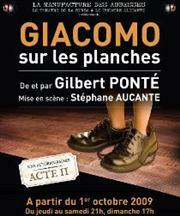 The one man act entitled “Giacomo sur les planches”, playing in Paris is well worth the ticket price. The actor Giacomo plays out his childhood and first love affair with theatre. He jumps from one character to another, his friends, parents and neighbours bringing well over 20 unique personalities to life. Each character is unique and distinct – his seamless transition between them is stunning. This play is highly recommended and for the reasonable price of 14 euros it beats any movie out there. Buy tickets here at a reduction.